At Eye Specialists of Indiana, we set the standard for excellence in cataract treatment. Patient-centered cataract surgery for comfort and quick recovery. 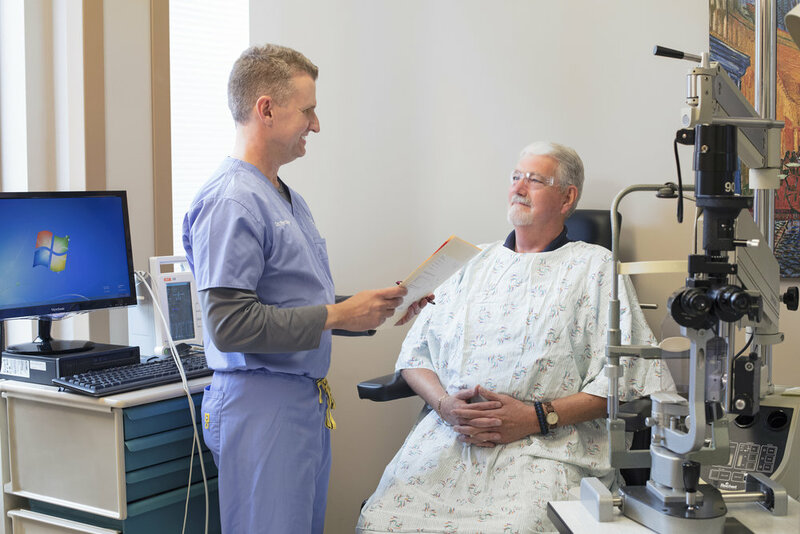 State-of-the-art cataract treatment in the Surgery Center of Eye Specialists of Indiana combines technical excellence with a warm, courteous staff and comfortable “living room” atmosphere. Our practice has been designed around our patients, focusing on results, comfort, and efficiency. Before treatment is elected, you will be given an extensive visual exam and thorough consultation with one of our doctors. All patients are evaluated for the presence of other eye diseases or abnormalities that could affect the results of vision rehabilitation. When present, these conditions are treated and managed appropriately to ensure to maximum improvement in vision. As an important part of your consultation, our doctors will explain the risks, benefits, and alternatives associated with surgical treatment. The surgical team at Eye Specialists of Indiana has made modern cataract treatment a routine, same-day procedure with a very high success rate in restoring vision. During this outpatient procedure, the cloudy cataract lens is removed and replaced with a soft, transparent intraocular lens implant (IOL). Surgery is typically completed in a matter of minutes and is performed with only mild sedation. You should be comfortable and able to communicate with us at all times. Immediately after surgery, patients relax comfortably in our recovery area before being evaluated by one of our doctors. We will check the pressure in your eye and make sure there are no conditions that need to be addressed. Shortly after this exit evaluation, our patients return home or to their hotel room. More than 95% of all cataract patients we’ve treated report having no eye discomfort following surgery. Because modern state-of-the-art cataract treatment allows the eye to heal more naturally much quicker, our patients are usually released with very few restrictions. Reading, watching television, sewing, and limited amounts of driving are normally permitted.